* Food-based menu planning is required. * Specific calorie requirements for the three age/grade groups, K-5, 6-8 and 9-12 - must be met. * Increase fruit quantity from three to five cups per week and a minimum of 1 cup per day. * Breakfast target got weekly sodium must be met. Breakfast served in the traditional cafeteria line allows students to eat well-balanced meal consisting of various types of hot and cold entrees, fresh fruit, 100% fruit juice and choice of skim or 1% flavored or unflavored milk. All school lunches meet or exceed state and federal nutritional guidelines. Join First Lady Michelle Obama, community leaders, teachers, doctors, nurses, Mom and Dad in nationwide campaign called “Let's Move” in the important goal of solving the epidemic of childhood obesity within a generation. We need to get moving. Look here for experts on fruits, vegetables and good health. 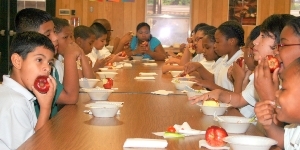 School Nutrition Association Professional Organization that works to ensure all children have access to healthful school meals and nutrition education. Kids Health is the most-visited site on the web for doctor-approved information about health, behavior and development from before birth through the teen years. Offers a personal eating plan with food and appropriate serving sizes that are right for you. Provides information about the Texas Department of Agriculture Food & Nutrition Division, including school meals.